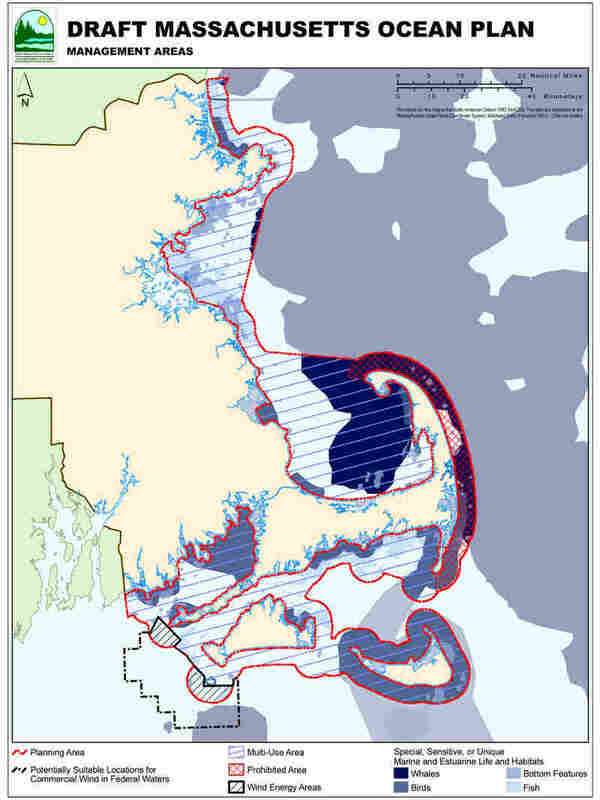 Zoning Busy Ocean Waters To Avoid Conflicts Both the federal government and the state of Massachusetts are making plans to zone the oceans, much like planners zone our cities. The goal is to balance the needs of fishermen, wind farmers, aquaculture developers, freighters, and the rich sea life that depends on this space for survival. 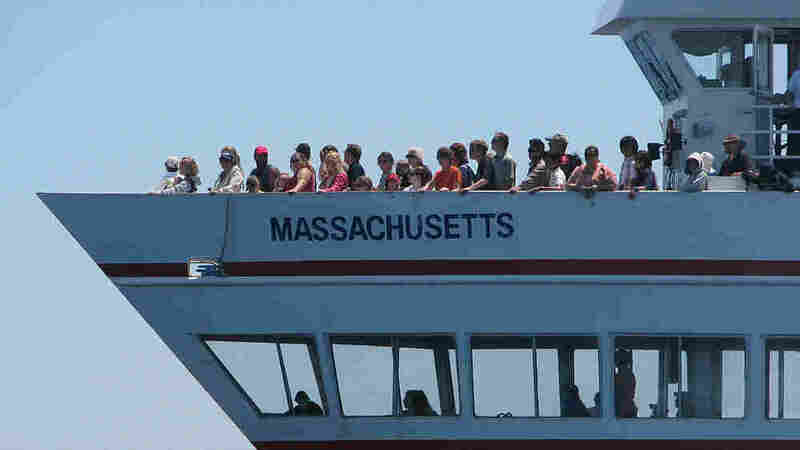 Passengers on a whale-watching ship in Massachusetts Bay. 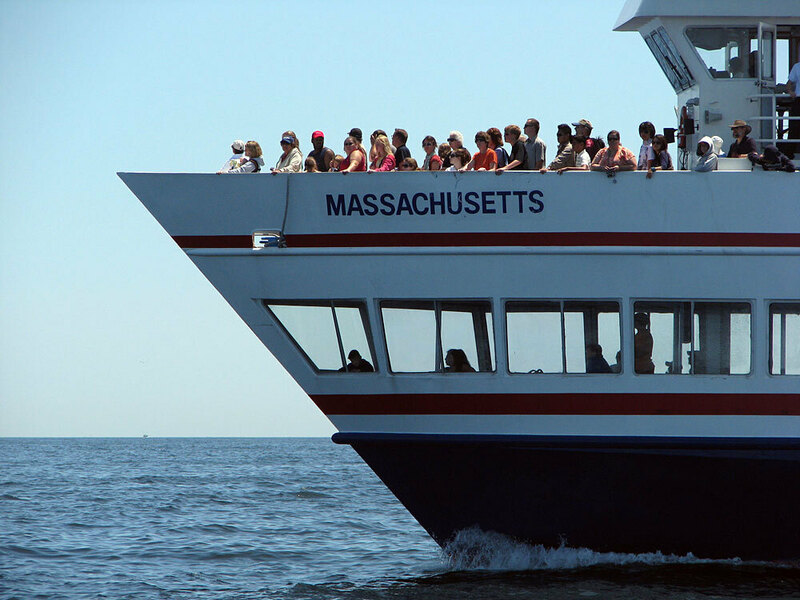 Whale watching is one of many recreational activities that draw people to the waters off the coast of Massachusetts. Anyone who has tried to dodge around Boston's notorious streets can tell you that the city is one bustling place. But it might come as surprise that the same can be said for the waters that extend off Boston's shore, out into Massachusetts Bay. The oceans may seem endless, but in fact we're starting to run out of elbow room. Now, both the federal government and the state of Massachusetts are making plans to zone the oceans, much as planners zone our cities. Capt. 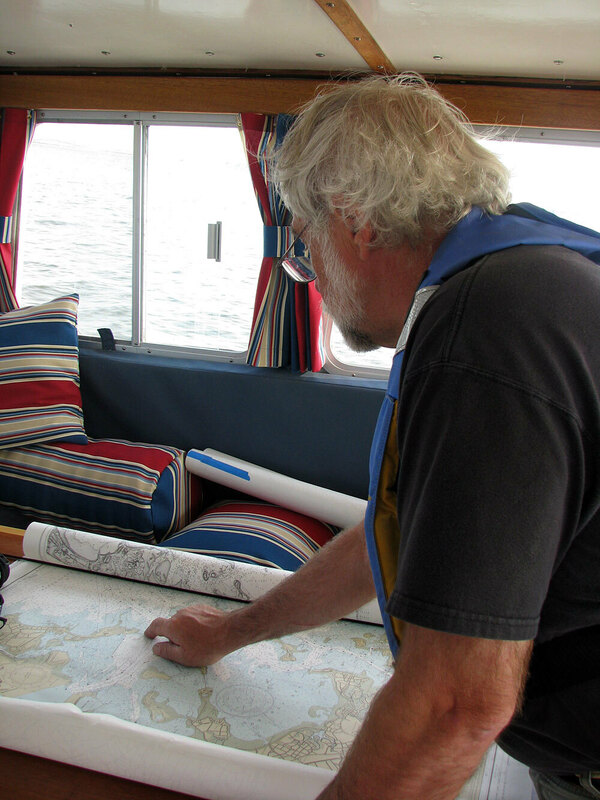 John Williamson examines a chart of Massachusetts Bay aboard his boat, Sea Keeper. Instead of trying to allocate space for schools and skyscrapers, ocean planners are trying to keep harmony between fishermen, wind farmers, aquaculture developers, freighter traffic and, of course, the rich sea life that depends on this space. To tell this story, Sally Yozell of the Nature Conservancy has invited us out to sea with her friend, Capt. John Williamson. On a bright and breezy morning, we steam out of Boston harbor on the Sea Keeper, which is a modified lobster boat. We pass freighters as the city skyline starts to recede, and we see fishing trawlers docked along the shore, unloading their catches. A lone windmill stands in the distance — a harbinger of some big plans for offshore wind in the area. And from the helm, Williamson says, don't forget about the rich and abundant wildlife here, above and below the waves. "We're now about to go into Massachusetts Bay," Williamson says, noting that it "is one of the most diverse ecological areas in the eastern seaboard. It also happens to be juxtaposed with an urban population of 6 million in Boston. Bostonians need, among other things, fuel to heat their homes. And some of that is shipped from overseas to a point about three miles off shore. "So we're coming up on the liquefied natural gas terminal," points out Yozell. "And you can see off to our side there's a service vessel that's probably finishing off some of the construction. It looks pretty benign from the surface," she says. And, indeed, I don't see anything on the ocean surface at all. But Yozell says from this point, a flexible pipe runs down 250 feet to the ocean bottom and into a buried pipeline, which carries the gas ashore. There's a second terminal nearby, so two giant gas tankers can unload at the same time. Williamson says this area is marked off on his navigational chart as a prohibited area. So this is one of the rare instances where the sea is already zoned — in this case an area reserved exclusively for gargantuan liquefied natural gas tankers. Sally Yozell of the Nature Conservancy aboard the boat Sea Keeper. 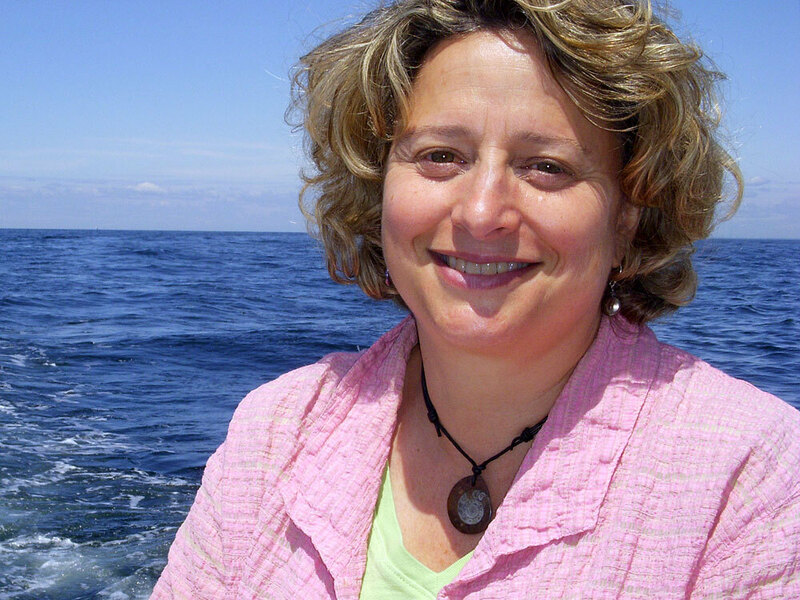 Yozell is among many conservationists calling for better management of how the ocean is used. A whale-watching vessel steams across our bow. Williamson throttles up and follows it toward the Stellwagen Bank National Marine Sanctuary. From the surface, the sanctuary is indistinguishable from the sea around it. But Williamson says not to be fooled. "It's very easy standing on the beach, and you look at an expanse of blue water, to think that it's all the same. But not every square inch of the ocean is the same. And some areas are very much more important than others." Stellwagen Bank is a case in point. Here, the water suddenly becomes shallower. That, in turn, lifts the nutrient-rich Labrador Current up from the depths and feeds a thriving ecosystem. Small fish called sand lances are abundant. They attract larger fish like tuna — and those attract a flotilla of fishing vessels. Seagulls and storm petrels wheel in the dazzling blue sky and dip down to join the feast. The whale-watching boat is here because the fish also attract humpback whales. "The sand lance is like a pat of butter for the humpback whale," Williamson says. "They're just a very fatty fish. So the whales here are spending the summer fattening up for a long, lean winter." Yozell says it's a compromise that whales and fishing boats share the marine sanctuary. It might work out, but no one can say for sure because no one is really looking at the big picture out here, she says. "The federal government manages for each individual sector," Yozell says. "So you have the fisheries service managing on fisheries. You have the minerals management service managing on energy. You have the Fish and Wildlife Service on birds, and Army Corps on dredging. And they all do it individually." The Obama administration is now in the midst of developing a comprehensive management plan for U.S. waters for the first time ever. Some states, such as Massachusetts, are already leading the way. States control the first three miles of coastal waters. The federal government controls everything beyond that, out to 200 miles. This summer, the Massachusetts secretary for Energy and Environmental Affairs, Ian Bowles, unveiled a draft plan for managing its waters. He says what really pushed the state Legislature to act was the prospect of some large offshore wind farms, including a controversial one off of Cape Cod. 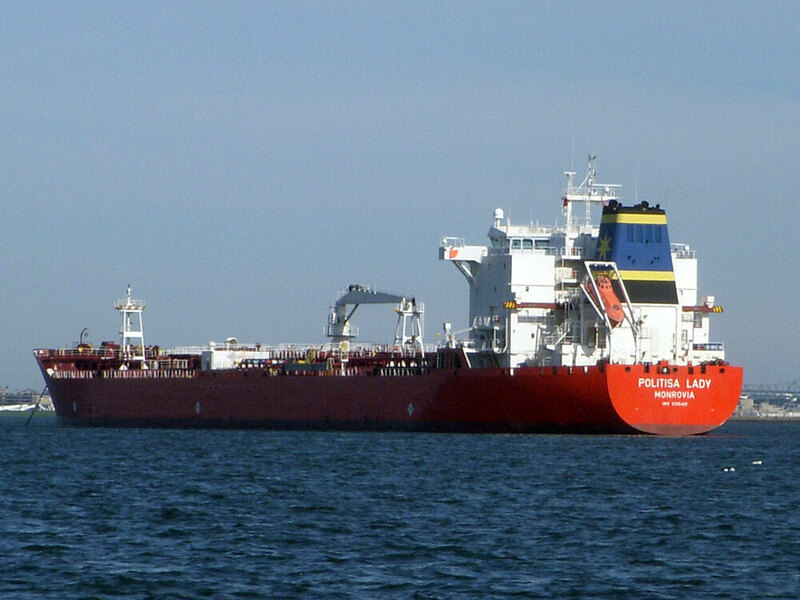 Anchored near Massachusetts Bay, the Liberian tanker Politisa Lady is one of many large shipping vessels that pass through these waters. "It's actually in federal waters and not covered by this plan, and actually so far along in the planning process that it was actually exempted by the Legislature." Bowles says. But there was such a push for wind energy off of Massachusetts that there was "really a sense we need this to happen," all the while limiting the environmental impact, he says. During the process, the state has tentatively selected two sites for offshore wind and rejected a third as too environmentally sensitive. With this plan, clean offshore wind will only meet just a tiny fraction of the demand for power in Massachusetts. That's left some people unhappy. Another sore point: The plan does not designate any new area as truly protected marine preserves. "We'll end up, of course, with criticism from the conservation community and the renewable energy community. And we think we've done a good job of balancing all those different factors," Bowles says. Yozell is by and large quite happy with the plan. "It's a brilliant framework," she says. But there's room for improvement. "We would like to see them go a little further on what we call the cumulative impacts: what happens over years and what happens when you layer different uses on the environment, for areas that certainly need to be set off for certain protections." And we are reminded on our boat tour that there's a lot to preserve out in Massachusetts Bay, as we come across a graceful — yet vulnerable — humpback whale. It spouts off to our starboard bow, and we watch as its giant fluke breaks the surface as the whale starts another dive. "Oh, it's cruising," Yozell says as we chase along at a respectful distance. "That's beautiful." This map shows important wildlife habitat and natural resource areas, and three management areas: protected (13 percent of the planning area), commercial wind areas (2 percent) and multiuse areas where a variety of uses (excluding commercial scale wind power) could be allowed within the context of environmental performance standards.